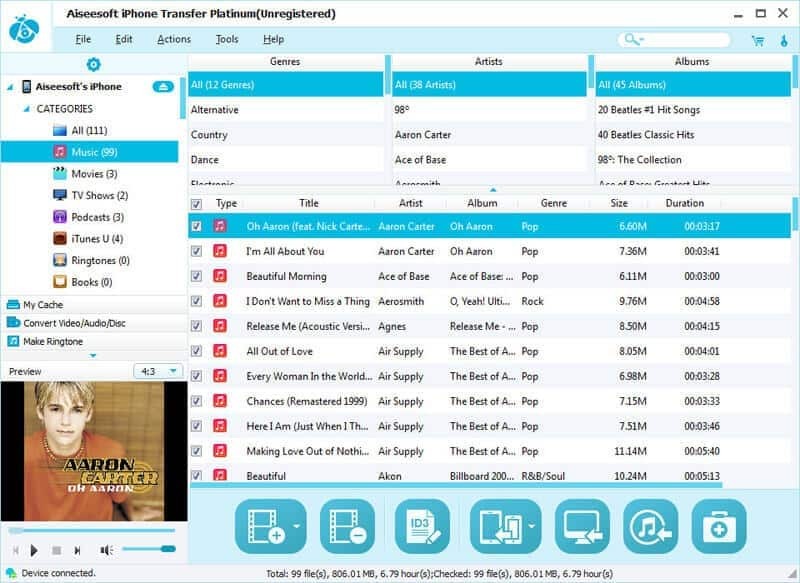 Aiseesoft iPhone Transfer Platinum is a responsible tool for iPhone users to manage all their iPhone files. With it, you can import local music, videos, ePub, PDF, and images to iPhone, and export all iPhone files(music, movies, pictures, TV shows, Podcast, iTunes U, eBooks, ringtones, Contacts, SMS(MMS), camera roll, voice memos, camera shot) to computer or iTunes. Also it enables you to convert incompatible video/audio files to iPhone, then output them to iPhone directly, even make iPhone Ringtone. What's more, it highly supports iPhone 5s/5c, iPad mini 2 and iPad Air profile. All video and audio can be converted to the format supported by iPad. All iPhone files including music, movie, pictures, TV shows, Podcast, iTunes U, eBooks, Camera Roll, ringtone, SMS (MMS), Contacts, voice memos and camera shot files can be transfered to computer easily and vise versa. With this Transfer, users can copy all SMS(MMS)/Contacts or the specific SMS(MMS)/Contacts on iPhone to Mac without any loss. Also you can backup your iPhone SMS(MMS) and Contacts on this program, and then you can delete the specific message, all messages of a specific contact, and even all backup messages. You are allowed to make your own iPhone ringtone from video and audio under the help of this software. This iPhone transfer can fix your device if the iTunes Database of iPhone has been damaged. This iPhone transferring software can add or edit the ID3 information of your iPhone video/audio files.